Last month I defrosted a ginormous tray of frozen chicken legs and then had no idea what to do with it. Usually I’m really independent when it comes to choosing the recipes I make (Pinterest is usually my favorite way to decide), but this time I sought help on Facebook, asking for ideas. Being connected to many fabulous cooks, I got many, and I chose this one because I had every ingredient and making them wouldn’t require an extra trip to the store. Score! The recipe is actually meant for chicken wings but it works great on legs (and would also work great on any other part of the chicken, for that matter). I mean what part of chicken doesn’t taste great with some sticky-smoky-salty-sweet glaze on it, right? So good! And for those not firing up their ovens in the heat of summer, I really think these could be done on the grill, but I think you’d have to grill them naked and then brush the sauce on near the end of the cooking time so that it wouldn’t burn up. If you try it with success, please let me know! Put oven rack in upper third of oven and preheat oven to 425°F. Line a large shallow baking pan (17 by 12 inches) with foil and lightly oil foil. Mince garlic and mash to a paste with salt using a large heavy knife. Transfer garlic paste to a large bowl and stir in soy sauce, hoisin, honey, oil, and cayenne. Add wingettes to sauce, stirring to coat. Arrange legs or wingettes in 1 layer in baking pan and roast, turning over once, until cooked through, about 35 minutes (the time is for wingettes but I really don’t remember cooking my drumsticks any longer! Maybe 10 minutes more? Just start checking at 35 minutes). Transfer legs or wingettes to a large serving bowl and toss with sesame seeds and scallion. *If using chicken wings instead of wingettes, cut off and discard tips from chicken wings with kitchen shears or a large heavy knife, then halve wings at joint. 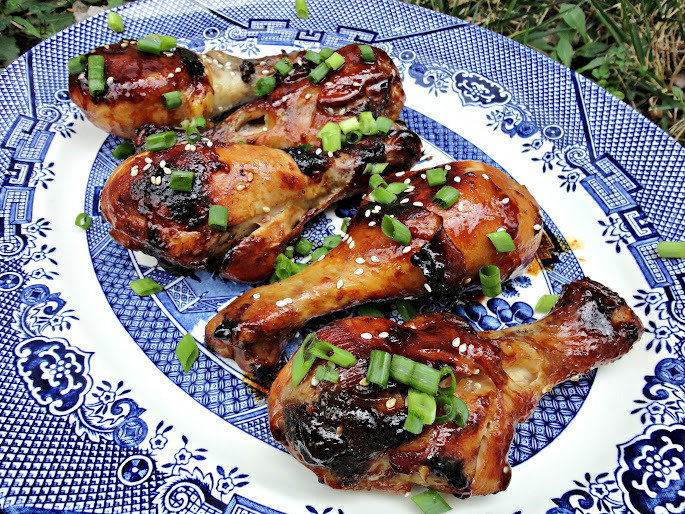 Posted in Asian, Meats, Snacks & Appetizers and tagged Asian, chicken legs, chicken wings, easy, sticky sesame. Bookmark the permalink. The sauce has all of the ingredients I love. Also love the blue platter. Oh I meant to mention this platter! Get used to seeing it b/c as part of our downsizing to make room for baby, I got rid of my enormous stack of platters and this was the only one I kept. I guess Joshua is more important than my food photography (the only reason I had so many) – lol. You know, I don’t cook with hoison often but I obviously need to start…sticky chicken you say? YUM! Neither do I but it’s really handy to have on hand b/c it adds great & easy flavor to Asian dishes. I bought my bottle like three years ago and it’s still good – apparently it lasts forever lol. It’s funny because I made sticky chicken just a few days ago! A little different than this though. 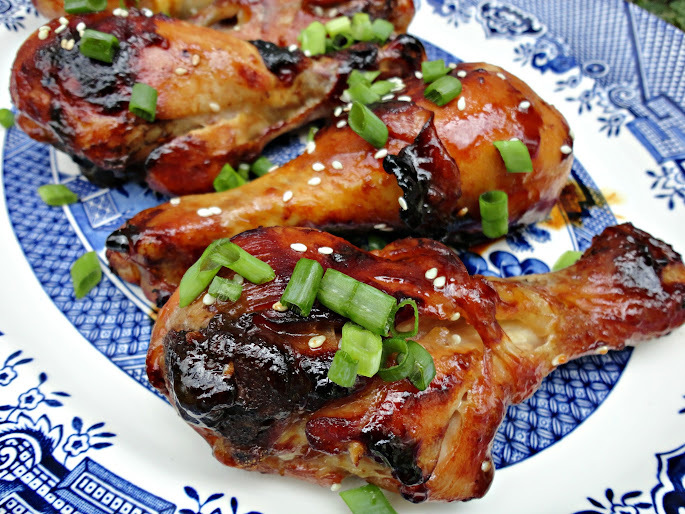 Yours looks terrific and I love using hoisin sauce…mmm! yum, I think I could eat chicken like this every day! I love this kind of sauce. that glaze you made for them sounds fabulous!!!! Yum, these sound delish! I’d definitely try them grilled, and as wings. I’m more of a wing girl myself :) Sounds like some great flavors going on!